- CZW Down In Flames (June 19, '99) = Acid fell to White Lotus. - CZW Street Fight '99 (July 19) = Acid & the Sensational One defeated Johnny Kashmere & White Lotus. - CZW Pyramid of Hell (August 21, '99) = Acid took down Wifebeater. - CZW September Slam (September 18, '99) = Acid was beaten by Nick Berk. - CZW Get It On! (September 25, '99) = Acid lost to Reckless Youth. - CZW Pain in the Rain (October 9, '99) = Acid fell to Corky. - CZW Cage of Death (October 16, '99) = Acid fought to a Draw with White Lotus. Later on, Acid & White Lotus defeated the Kashmirenos. - CZW The War Begins (November 20, '99) = Acid won a "Handicap" Match over the Kashmirenos. - CZW Bloodbath (January 8, '00) = Acid & Jon Dahmer beat the Kashmirenos. - CZW Night of Main Events (February 5, '00) = Acid took down Nick Berk. - CZW Climbing The Ladder (February 12, '00) = Acid fought to a No-Contest with Ty Street. 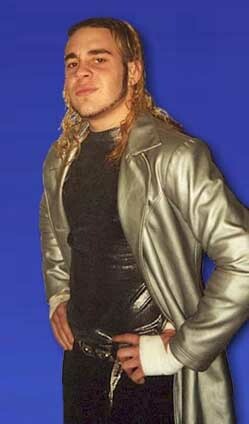 - ECWA 4th Annual Super Eight Tournament (February 26, '00) = Acid lost in the first round to Scoot Andrews. Christopher Daniels won the tournament. - CZW March Violence (March 11, '00) = Acid defeated White Lotus. - CZW Controversy 101 (April 1, '00) = Acid & Ty Street lost to the CZW Tag-Team Champions, the Haas Brothers. - CZW Winner Takes All (April 8, '00) = Acid beat Mercury. - CZW A Living Hell (May 6, '00) = Acid won over Nick Mondo. - CZW They Said It Couldn't Be Done (June 25, '00) = Acid retained the CZW Junior Heavyweight Title, fighting to a No-Contest with Ric Blade. - CZW No Rules, No Limits (July 22, '00) = The Backseat Boyz (Acid & Johnny Kashmere) stayed the CZW Tag-Team Champions, taking down Ric Blade & Nick Mondo. - CZW Blood, Sweat, & Violence (August 12, '00) = The Backseat Boyz lost the CZW Tag Titles to Ric Blade & Nick Mondo. - CZW Cage of Death II... After Dark (September 9, '00) = Acid fought to a No-Contest with Nick Mondo. - CZW Rules Were Made To Be Broken (October 10, '00) = Acid lost a "Handicap" Match to the CZW Tag Champs, Ric Blade & Nick Mondo. - CZW Jersey Rulz (November 11, '00) = Acid & Nick Gage were beaten by Johnny Kashmere & Lobo. - CZW Delaware Invasion (January 20, '01) = Acid won a "Handicap" Match over Eddie Valentine & the Briscoes. - CZW Crushing the Competition (February 10, '01) = Acid defeated Nick Berk. - CZW Break On Thru (February 17, '01) = Acid took down Nick Berk. - CZW Destruction In Dover (February 28, '01) = Acid won a "Gauntlet" Match. - CZW War At Station 44 (March 10, '01) = Acid won a "Ladder" Match over Ric Blade. - CZW Enter The Zone (March 17, '01) = Acid & Nick Mondo fell to Justice Pain & Reckless Youth. - CZW Payback (April 1, '01) = Acid won a "Three-Way" Match over Nick Berk and Reckless Youth. - CZW The Boss Is Back (April 7, '01) = Acid beat Ruckus. - CZW Un F'n Believable (April 14, '01) = Acid fought to a Double Countout in a "Triple Threat Elimination" Match with Ric Blade. Reckless Youth was the other participant. - CZW Stretched In Smyrna (May 12, '01) = Acid lost to Minoru Fujita. Later on, Acid defeated Johnny Kashmere. - CZW Best of the Best I (May 19, '01) = Acid beat Joel Maximo, Ruckus, and Jay Briscoe, before losing in the finals of the Best of the Best Tournament to Winger. - CZW Take One (June 8, '01) = Acid won over Johnny Kashmere. - CZW Breakaway Brawl (June 9, '01) = Acid & John Zandig lost a "Barbed Wire Light Tube Death" Match to Johnny Kashmere & Justice Pain. - CZW A New Beginning (July 7, '01) = Acid lost a "Three Way" Match to Ruckus. Z-Barr was the other participant. - CZW H8 Club: Dead? (July 14, '01) = The Backseat Boyz & Justice Pain won a "Fans Bring The Weapons" Match over Nick Mondo, John Zandig, & Wifebeater. - CZW What About Lobo? 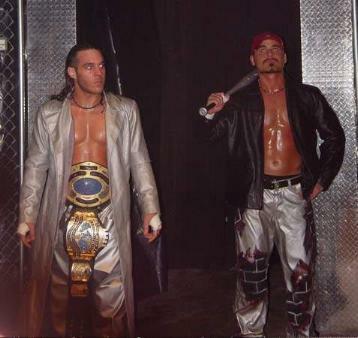 (July 28, '01) = The Backseat Boyz won the CZW Tag-Team Titles, defeating the Briscoes. - CZW September Slam (September 8, '01) = Acid lost a "Three-Way" Match to Ruckus. Johnny Kashmere was the other participant. Later on, the Backseat Boyz took down V.D. - CZW They Said It Couldn't Be Done... Again (September 22, '01) = The Backseat Boyz & Justice Pain fell to Jay Briscoe & V.D. - CZW Enough Is Enough (September 29, '01) = Acid, as the CZW Junior Heavyweight Champ, fought to a No-Contest with the BJPW Junior Heavyweight Champ, Ruckus. The titles were vacated as a result. - CZW And Justice For All (October 27, '01) = The Backseat Boyz retained the CZW Tag-Team Titles, beating V.D. - CZW Showdown In Sewell (November 10, '01) = The Backseat Boyz stayed the CZW Tag Champs, winning a "Three-Way" Match over the H8 Club and Mark Briscoe & the Amazing Red. - CZW Cage of Death III (December 15, '01) = Acid won the vacated CZW Junior Heavyweight Title, taking down Ruckus. - CZW Answering The Challenge (January 12, '02) = Acid retained the CZW Junior Heavyweight Championship, beating Winger. - CZW This Time It's Personal (February 9, '02) = The Backseat Boyz stayed the CZW Tag-Team Champs, winning over the Ballard Brothers. - CZW Out With The Old, In With The New (March 9, '02) = The Backseat Boyz lost the CZW Tag-Team Titles to V.D. - CZW A Higher Level Of Pain (April 13, '02) = Acid defeated Nick Berk. Later on, the Backseat Boys fell to the H8 Club. - CZW Process of Elimination (April 27, '02) = Acid fought to a No-Contest with the CZW Heavyweight Champion, Justice Pain. - CZW High Stakes (May 11, '02) = The Backseat Boys beat Josh Prohibition & M-Dogg 20. Later on, Acid pinned Jerry Lynn. - CZW Best of the Best II (June 8, '02) = Acid defeated Gabriel, M-Dogg 20, B-Boy, and Jody Fleisch to win the tournament. - CZW Deja Vu (July 13, '02) = The Backseat Boys won over the Lost Boys. - CZW No Excuses (August 10, '02) = Team CZW (The Backseat Boys & the Softcore Connection) lost a "Wargames" Match to Team NWA Wildside (The Lost Boys & T-N-T). - NWA-TNA PPV (Show #11, August 21, '02) = The Backseat Boys lost an "Elimination" Match to America's Most Wanted. Chase Stevens & Cassidy O'Reilly and Slash & Cobain were the other participants. - CZW Tournament of Death I (August 31, '02) = The Backseat Boys won a "Tag Scramble" Match over the New School, Sonjay Dutt & Derek Frazier, and Jon Dahmer & Towel Boy. - CZW Jersey Re-Invasion (September 6, '02) = Acid competed in a Battle Royal, which was won by the Hurricane Kid. Later on, the Backseat Boys won over the New School. - CZW Ultraviolent Freedom of Expression (September 13, '02) = The Backseat Boys took down T-N-T.
- CZW Sanctioned In Blood (September 28, '02) = Acid defeated Nick Mondo. - RoH Glory By Honor I (October 5, '02) = The Backseat Boys won over Steve Corino & Homicide. - CZW Beyond The Barrier (October 12, '02) = Acid pinned M-Dogg 20. - CZW Havoc In Hellware (October 26, '02) = The Jive Turkeyz (aka the Backseat Boys) lost to the CZW Tag-Team Champs, the H8 Club. - CZW Night of Infamy (November 9, '02) = The Backseat Boys fought to a No-Contest with Nick Mondo & M-Dogg 20. - CZW Cage of Death IV (December 14, '02) = The Backseat Boys won a "TLC" Match over Ric Blade & Nick Mondo. - CZW One More Time (December 28, '02) = Acid retained the CZW Junior Heavyweight Title, beating Sonjay Dutt. - RoH Final Battle '02 (December 28) = The Backseat Boys lost a "Tag Scramble" Match to Special K (Angeldust & Deranged). Da Hit Squad were the other participants. - CZW Live Again (January 18, '03) = Acid lost the CZW Junior Heavyweight Title to Ruckus. - CZW Uncivilized (February 8, '03) = The Backseat Boys won the CZW Tag-Team Titles, beating the H8 Club. - CZW Divide & Conquer (March 8, '03) = Acid lost to the CZW Iron Man Champion, Nick Mondo. - RoH Expect the Unexpected (March 13, '03) = The Backseat Boys lost a "Tag Scramble" Match to AJ Styles (whose partner, the Amazing Red, was taken out before the match). The other participants were the Carnage Crew and the SAT. - RoH Night of the Champions (March 22, '03) = The Backseat Boys defeated the Ring Crew Express. - CZW Best of the Best III (April 12, '03) = Acid beat Tony Mamaluke and Ric Blade, before falling to Dutt. B-Boy won the tournament. - RoH Epic Encounter (April 12, '03) = The Backseat Boys took down Da Hit Squad. - 3PW A Funkin' Classic (May 3, '03) = Acid defeated Ric Blade. - CZW Then And Now (May 10, '03) = Acid was beaten by Homicide. - RoH Do or Die (May 31, '03) = The Backseat Boys won over Special K (Jody Fleisch & Slim J). - CZW Truth Or Consequences (June 14, '03) = The Backseat Boys retained the CZW Tag-Team Titles, taking down the Briscoes. - CZW Extreme Eight (June 28, '03) = The Backseat Boys stayed the CZW Tag Champs, beating Sonjay Dutt & Ruckus. - RoH WrestleRave '03 (June 28) = Acid won a "Fight Without Honor" Match over Homicide. - RoH Death Before Dishonor (July 19, '03) = The Backseat Boys & the SAT lost a "Scramble" Match to Special K (Mikey Whipwreck, Brian XL, Hydro, & Angeldust). - CZW Deja Vu 2 (July 20, '03) = Acid & B-Boy defeated Homicide & Mafia. - CZW Tournament of Death II (July 26, '03) = Acid, in a "Non-Tournament" Match, took down Z-Barr. - CZW Aftermath (August 9, '03) = The Backseat Boys kept the CZW Tag-Team Titles, beating Adam Flash & Ian Knoxx. - RoH Bitter Friends, Stiffer Enemies (August 16, '03) = The Backseat Boys lost a "Tag Scramble" Match to Special K (Izzy & Dixie). The Carnage Crew and the SAT were the other participants. - CZW Respect (August 3, '03) = The Backseat Boys lost a "Three-Way" Match to Adam Flash & Ian Knoxx. The Rebel's Army were the other participants. Since the Rebel's Army were the ones pinned, the Backseat Boys retained the CZW Tag Titles. - RoH Beating the Odds (September 6, '03) = The Backseat Boys won a "Tag Scramble" Match over the Ring Crew Express, the SAT, and Special K (Izzy & Dixie). Later on, Acid(0-1) lost a "Field of Honor" Match to Homicide(1-0). - CZW Redefined (September 13, '03) = Acid defeated Tony Mamaluke, Chris Hero, Jimmy Rave, and Chris Cage to win the Iron Man Tournament and become the CZW Iron Man Champion. - RoH Glory With Honor II (September 20, '03) = The Backseat Boys won the "Tag-Team Gauntlet" Match by beating Special K (Izzy & Dixie), winning the RoH Tag Titles. - CZW Pain In The Rain II (October 4, '03) = Acid stayed the CZW Iron Man Champion, winning over Nick Gage. - CZW Uprising (October 11, '03) = Acid lost a "Four-Way" Match to the IWA Mid-South Light-Heavyweight Champion, Sonjay Dutt. Jimmy Jacobs and Alex Shelley were the other participants. - RoH The Tradition Continues (October 16, '03) = The Backseat Boyz lost the RoH Tag-Team Titles to Special K (Izzy & Dixie). - CZW Uprising (October 25, '03) = Acid retained the CZW Iron Man Title, beating Ruckus. Later on, Acid & B-Boy fell to Ruckus & Sonjay Dutt. - RoH Main Event Spectacles (November 1, '03) = The Backseat Boys won a "Tag Scramble" Match over the Carnage Crew, the SAT, Special K (Angeldust & Hydro), and Teddy Hart & Jack Evans. - CZW Night of Infamy II (November 15, '03) = Acid defeated Danny Maff. - RoH The Conclusion (November 28, '03) = The Backseat Boys took down the Outcast Killaz. - RoH War of the Wire (November 29, '03) = The Backseat Boys defeated Hotstuff Hernandez & Fast Eddie. - CZW Cage of Death V (December 13, '03) = Acid lost the CZW Iron Man Championship to Jimmy Rave. Later on, Team Hi-V (Acid, Adam Flash, Nate Hatred, Johnny Kashmere, B-Boy, & the Messiah) lost the "Cage of Death" Match to Team Ultraviolence (John Zandig, Nick Gage, Ian Knoxx, New Jack, Lobo, & Wifebeater). - RoH Final Battle Convention Card (December 27, '03) = Acid beat Sonjay Dutt. - CZW Allentown Project (January 16, '04) = The Backseat Boys defeated Jimmy Jacobs & Alex Shelley. - CZW Street Fight 2K4 (January 17, '04) = The Backseat Boys, along with Justin Credible, lost the CZW Tag-Team Titles to the Rebel's Army (Derek Frazier, Greg Matthews, & Rockin' Rebel). - RoH The Last Stand (January 29, '04) = The Backseat Boys won a "No Disqualification" Match over the Carnage Crew. - RoH 2nd Anniversary Show (February 14, '04) = The Backseat Boys lost to the RoH Tag Champs, the Briscoes. - CZW Retribution (April 3, '04) = Acid defeated Teddy Hart to re-gain a CZW roster spot. - CZW Apocalypse (May 1, '04) = Acid, Nick Gage, & Wifebeater lost a "Tables Elimination" Match to Adam Flash, Sabu, & the Messiah. - RoH Round Robin Challenge III (May 15, '04) = Acid lost a "Six-Man Mayhem" Match to John Walters. Roderick Strong, Hydro, Izzy, and Masada were the other participants. - RoH Generation Next (May 22, '04) = Acid & the New and Improved Carnage Crew took down the Carnage Crew (Loc, Devito, & Justin Credible). - CZW Trifecta Challenge III (June 12, '04) = Acid lost a "Bounty" Match to Adam Flash. - RoH Survival of the Fittest (June 24, '04) = Acid fell to Colt Cabana in the Semifinals of the SOTF Tournament. - RoH Reborn: Completion (July 17, '04) = Acid was beaten by Jimmy Rave. - RoH Death Before Dishonor II, Part 1 (July 23, '04) = Acid won a "Four Corner Survival" Match over Matt Sydal, Ace Steel, and Delirious. - RoH Death Before Dishonor II, Part 2 (July 24, '04) = Acid won a "Six-Man Mayhem" Match over Shawn Daivari, Matt Sydal, Danny Daniels, Delirious, and the Great Kazushi. - RoH Testing The Limit (August 7, '04) = Acid lost to the RoH World Champ, Samoa Joe. - RoH Scramble Cage Melee (August 28, '04) = Acid lost a "Scramble Cage Melee" Match to Jack Evans. The Carnage Crew, the Ring Crew Express, the Outcast Killaz, Dan Maff, BJ Whitmer, Fast Eddie, and Altar Boy Luke were the other participants. - RoH Glory By Honor III (September 11, '04) = Acid won a "Six-Man Mayhem" Match over Ace Steel, Fast Eddie, Angeldust, Izzy, and Kahagas. - RoH Midnight Express Reunion (October 2, '04) = Acid lost a "Four Corner Survival" Match to Jimmy Rave. BJ Whitmer and Josh Daniels were the other participants. - RoH Gold (October 15, '04) = Acid fell to Matt Sydal. - RoH Joe vs. Punk II (October 16, '04) = Acid lost a "Four Corner Survival" Match to Josh Daniels. Matt Sydal and Angeldust were the other participants. - RoH Weekend of Thunder, Night 2 (November 6, '04) = Acid lost a "Four Corner Survival" Match to Izzy. Jack Evans and Fast Eddie were the other participants. - RoH All-Star Extravaganza II (December 4, '04) = Acid took down Jerk Jackson. - RoH Final Battle '04 (December 26) = Acid fell to Jimmy Jacobs. - 3PW Spring Cleaning (April 9, '05) = Acid defeated Damian Adams. - Wrestle Reunion #2 (August 27, '05) = The Backseat Boyz lost a "Four Corners" Match to the Fantastics. The Samoan Island Tribe and Thunderfoot #1 & #2 were the other participants. - Toryumon Mexico Dragon Mania '06 (May 13) = Acid & American Gigolo lost a "Four Way Elimination" Match to Milano Collection AT & Hiromi Horiguchi. Averno & Mephisto and Bruto Issue & Okumura were the other participants. - King of Europe Tournament '07 (April) = Acid lost in the first round to Pac. Nigel McGuinness won the tournament. - CZW Summer School (June 14, '08) = Acid fell to Nick Gage. - CZW No Pun Intended (June 21, '08) = Acid was beaten by Drake Younger. - CZW A Tangled Web (July 12, '08) = Acid took down Devon Moore. - CZW Blood Pressure: Rising (May 9, '09) = Acid fell to Sami Callihan. - CZW Tournament Of Death 8 (June 6, '09) = In a non-tournament match, Acid defeated Sami Callihan. - CZW Best of the Best 9 (June 13, '09) = In a non-tournament match, Acid lost to the CZW World Heavyweight Champion, Drake Younger. - CZW Starting Point (July 11, '09) = Acid lost a "Three-Way Elimination" Match to the CZW World Heavyweight Champion, Drake Younger. Sami Callihan was the other participant. - CZW Chri$ Ca$h Memorial Show '09 (September 12) = Acid took down Little Mondo. - CZW Down With The Sickness Forever '09 (September 12) = Acid was beaten by Jon Dahmer. - CZW Severed Ties (October 10, '09) = Acid fell to Greg Excellent.